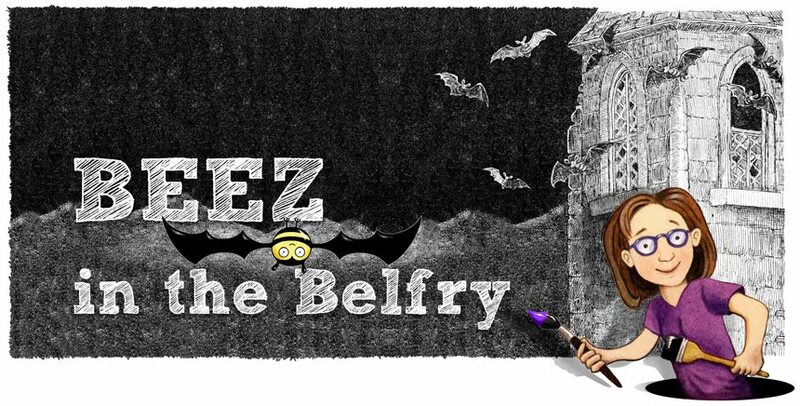 BEEZ in the Belfry: Happy 101th! "One-oh-one-th"? or "One hundred and first?" Every year, on my grandmother's birthday (Aug. 26th), we have a party for her. In the graveyard. This year we did it a little early because both the kids would be away this week. Gramma Magda was an amazing lady who once rescued her mother-in-law from a concentration camp. Show of hands... how many of us would do that? Exactly. She was also an artist and had a really warp-y sense of humor. I like to think she is smiling down at me from heaven and nodding over my decision to go to Cartoon School! If she were still alive, she'd probably enroll right along with me. Although... there's an interesting idea for a comic... hmmm... zombie or ghost cartoon student? Everyday life is just so full of "material"! And she loved bears and chocolate. That's why we put a bear on the gravestone and we always place our food offerings right under his nose. I am sure there is a bear in the surrounding woods (perhaps with my grandmother's own spirit) who anxiously awaits the arrival of August 26th every year! Alex placed the huge, super fudge-y looking piece of chocolate cake - from the Foothills in Warner - under the bear's nose. I embellished it with a little flower from the Foothill's porch. Lilah thought it would be a good idea to "check" and make sure the cake was chocolate-y enough. We all agreed that would be a good idea. And everyone knows that chocolate cake eaten off the ground has no calories. Although it does get under one's finger nails. Good thing it started out as a huge piece. There was still plenty left for the bear. I think she is still very stylish, at age almost-9, but you can't help but love the self-confidence at age 4! 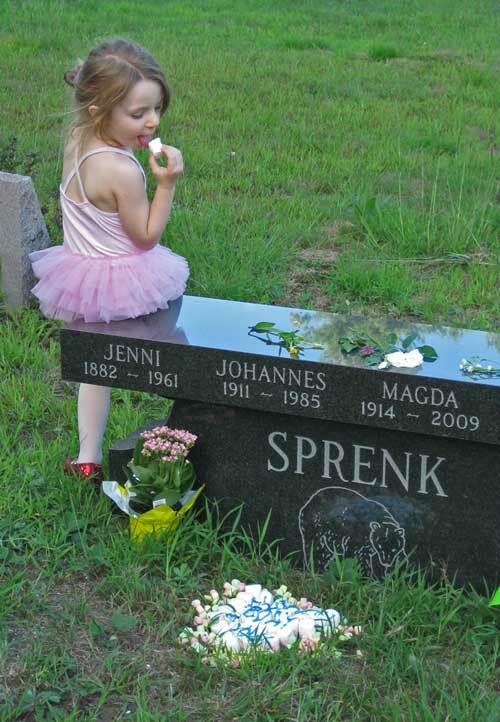 Not everyone can carry off a pink tutu and red glitter shoes. 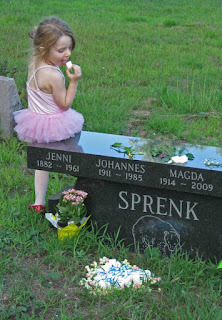 At a graveyard party. Wow - this was the lead article in a whole bunch from you, including the reminder about your kickstarter project. THANKS! I'm all in . 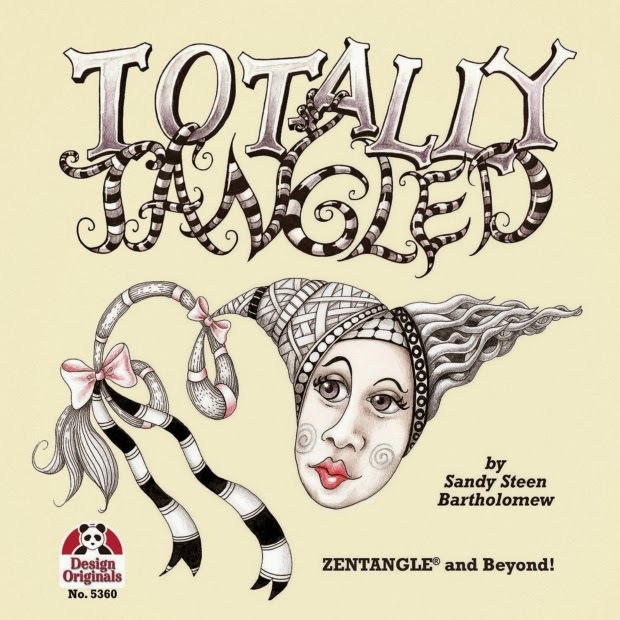 . .
Tangle Library APP Gets a Kells Update!